Caitlin was born on Friday 13 May 2005. She seemed to be a healthy little girl. On day 5 and 6 she stopped drinking and was admitted to neonatal ICU at Greenacres Hospital (Port Elizabeth, Sout Africa), with dehydration and signs of infection., that night she stopped breathing and they started ventilating. Day 7 and 8 were very long days, her body started giving up and on day 9 the doctor informed us that she was clinically brain dead. On day 9 we had to decide whether or not to put the ventilator down. Day 9 came with a huge miracle – my little girl was breathing on her own again and there is hope. She recovered so quickoly that on day 11 no more support from machines were needed. One week later the same pattern happened and the doctors were puzzled. The pediatrician requested a metabolic sifting to be done. 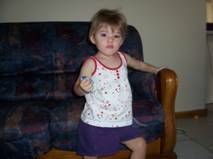 On June the 3rd 2005 she was diagnosed with Propionic Acidemia. In October 2005 a mickey tube was inserted for feeds. All her developmental milestones are delayed, she is still not walking or talking, but can stand with support and crawl on her bum. Our big problem is pneumonia every now and then. She was a very friendly little girl and touched so many peoples lifes. We miss her so much. There was not one day the past 6 months that we gave not thought about her.